and a Selection of Seeds. Join our Club – become a member of the Gardening with Children Club its FREE, members receive special discounts and offers on gardening equipment and wildlife products as well as Seasonal Newsletters containing fun activities to make, cook and do and their own unique membership number which you will need to enter this competition. NB As there is not much time to process new club applications and issue membership numbers before the competition closes, competition entries will be permitted from non club members who by entering this competition will automatically be made members and later issued with a membership number, please state ‘NEW MEMBER’ on the entry form. 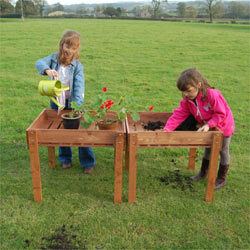 Why would you like to win the Wooden Raised Bed Kit for your School? What would you grow in it? Send in a photograph of something that you have grown or are growing at School. For full details and an entry form click here, the closing date is Friday 27th May 2016. Aubergines are bright purple fruits that are used in many Greek, Italian, Turkish and Middle Eastern dishes, they have been grown for more than 5,000 years and belong to the Solanaceae family which include tomatoes, potatoes, sweet peppers and chilli peppers. The purple Aubergine that we see today was evolved from a spiny plant from India which bore small white egg-shaped fruit, this is why the Aubergine is also known as the eggplant. Aubergine plants have large green leaves with purple veins and purple stems (see picture above). Many gardeners think that they are difficult to grow but this is not the case, they do need warm temperatures ideally grow them on a sunny windowsill or in a greenhouse/polytunnel, they can be put outdoors in a warm, sunny sheltered position but they will take longer to ripen and be smaller. If you want Aubergines in late Summer sow your seeds now before the end of April (seeds can be sown earlier from January onwards indoors), as well the medium, oval purple varieties there are many others available from seed; large, small, round, long and thin, red, green, yellow, white or even striped. Sow seeds about 6mm deep in trays of compost or individually in small pots and water well. Place in a warm position approx. 20-25C/68-77F (see the back of your seed packet) either on a light windowsill or in a heated propagator, they will germinate in about 14 days. Transplant the seedlings that have been grown in trays individually into small pots when they have their second set of leaves. After a few weeks when roots show at the bottom of the pots, plant the Aubergines into their final growing positions either in large pots, growbags or in the greenhouse border. Water little and often, when their purple flowers appear gently spray them with tepid water to encourage the fruit to set. Feed regularly once the fruits have set and support the plant with a cane, for large fruit varieties after 5 fruits have formed cut off the growingtip/side shoots and any flowers so that the plants energy goes into producing 5 delicious dark purple fruits for smaller fruit varieties more fruits can be left to grow – see growing instructions on the back of the seed packet. There are many different ways to cook Aubergines one of the simplest is sliced on the BBQ, serve as a side dish with meat and fish and a Tzatziki dip (click here for the recipe for Tzatziki), sow your seeds now and impress your friends this Summer with home grown and freshly picked Aubergine on your BBQ. Dont forget to enter the FREE Gardening With Children competition in the Family Zone for a chance to win a fantastic Kids Wooden Standing Raised Bed Growing Table simply identify the 5 Wildflowers shown in the pictures hurry the closing date is this Saturday 30th April 2016 click here for more details and to enter. Spring is here and there are lots of flowers, fruits, herbs and vegetables to sow, plant and grow now but sometimes there simply is not enough room to grow everything that you would like to, the answer it to add a Wooden Raised Bed. 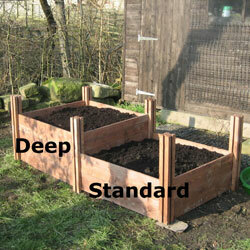 Wooden Raised Beds are perfect for growing fruit, flowers, herbs and vegetables, they provide good drainage, can be filled with good quality compost, will easily accommodate fleece, film and netting to protect your crops and are at a height that makes sowing, planting, harvesting and watering easier. Send in a photograph of something that you have grown at School. For full details and an entry form click here, the closing date is Friday 27th May 2106. It is the perfect size and height for younger children to have their own real vegetable and flower garden and is ideal for growing Strawberries, Herbs, Lettuce, Spring Onion, Radish, baby vegetables including Beetroot, Turnip and Round Carrots and some of your favourite flowers. For full details, an entry form and to view the pictures click here, the closing date is Saturday 30th April 2016. To Dig or not to Dig? This week it’s been perfect weather for digging and I have been on my allotment making the most of it, digging can be hard work but it is also very satisfying looking at a newly dug and prepared bed ready for planting. The soil has dried out from the recent floods helped by the wind and the frosts, I was pleasantly surprised how many worms there were, I wasn’t sure whether they would survive beneath the flood water. One of the most important jobs in the garden is to improve and maintain the quality of your soil, the key way to do this is to add or dig in organic material such as rotted garden/kitchen compost from your Compost Bin or well-rotted farmyard manure which has been allowed to stand for at least six months. Weed the soil, in late Autumn spread compost/manure over the surface, the worms will work it into the soil, more compost/manure can be added during the growing season. Weed the soil, push in your spade, lift the soil, turn it and drop it back in its original position, breaking up any large lumps with the edge of your spade, a layer of organic matter can then be added to the surface which the worms will incorporate or can be forked/raked in when you prepare your bed for sowing/planting, alternatively a layer of compost can be put on the soil after weeding which will be incorporated as you dig. Weed the soil, and dig a trench across your bed to a spades depth and about 30cm wide, put the soil you have removed aside this will be used at the end to fill the last trench. Fill the bottom of the trench with compost/manure, working backwards dig another trench placing the soil on top of the compost/manure in the first trench, repeat this process until you get the end of your bed, fill the last trench with the soil that you set aside from the first trench. With double digging the soil is worked to the depth of two spades, breaking up the sub soil, this will improve drainage and is useful on a new plot or when deep beds are being prepared. Weed and dig a trench as with single digging putting the soil removed aside, add compost/manure to the bottom of the trench and dig in to a spades depth, add another layer of compost/manure on top then working backwards dig another trench placing the soil on top of the compost/manure in the first trench repeat this process and fill in the last trench with soil removed from the first trench. The best time to dig heavy soil is in the Autumn this will allow the frost and rain to break it down, light and sandy soils are best left until the spring, fork in a general purpose fertiliser prior to sowing/planting and break up any lumps of soil with a fork/rake. Not everyone enjoys or is able to dig, growing crops in Raised Beds is the perfect solution, crops can be easily planted, tended, watered and harvested without standing on the soil thus eliminating the need to dig, all that is required is to weed, and lightly fork in compost or fertiliser with a Hand Fork in Spring or apply a mulch of compost/manure in Autumn which the worms will gradually work into the soil. I find digging with a spade hard work as it is quite heavy, I use a border fork which is slightly smaller than a standard fork, although I can only dig smaller ‘spadefuls’ at a time and it may take a little longer I find it a lot easier and there is less strain on my back. Wooden Raised Beds are perfect for growing fruit, herbs and vegetables, they provide good drainage, can be filled with good quality compost, will easily accommodate fleece, film and netting to protect your crops and are at a height that makes sowing, planting, harvesting and watering easier. Thank you to everyone who entered the May/June School Competition the overall winner was Hazlehurst Community Primary School, Ramsbottom their prize of a Kids Standing Raised Bed is on its way. The competition was to create a new fruit/vegetable by combining two vegetables or fruits together, there were lots of inventive and wonderful combinations as well as some delightful drawings of the new fruits/vegetables here is a selection from the winning school (as written on their entry forms by the pupils). There are some really good combinations; fruits are definitely more popular than vegetables, well done to all of you. The Summer Family competition will be posted on the Gardening With Children Competition page soon, so keep a look out and have a go, you could be our next winner. It is the perfect size and height for younger children to have the experience of their very own real vegetable and flower garden. Crops can be easily tended, watered and picked, they are ideal for growing Strawberries, Herbs, Lettuce, Spring Onion, Radish and baby vegetables including Beetroot, Turnip and Round Carrots, why not plant a few of your favourite flowers between the crops for a wonderful display. Which fruits/vegetables it is made from? For full details and an entry form click here. Look at the pictures of the insides of various fruits and vegetables and work out, using the following list, what they are. To view the pictures and for full details of how to enter click here. Both competitions are free to enter, the closing dates are Tuesday 30th June 2015.